"I ate my Littmus Lozenge slowly. It tasted good. It tasted like root beer and strawberry and something else I didn't have a name for, something that made me feel kind of sad. I looked over at Amanda. She was sucking on her candy and thinking hard. 'Do you like it?' Miss Franny asked me. 'Yes ma'ma,' I told her. 'There's a secret ingredient in there.' Miss Franny said. I've never read a description of a small item in a book that so perfectly summed up the entire book...it was sweet and sad...like root beer and strawberry and melancholy. It's where all those things came together. It was like life. Sweet and wonderful and sad and feeling one somehow makes you feel all of them. I think I might be a bit older than Kate DiCamillo's target audience, but readers of all ages can identify with the characters in her books. She brilliantly captures life...the pain, the sorrow, the happiness, the root beer and strawberry, and her characters feel all of those emotions. Because of Winn-Dixie is the story of young Opal who lives with her preacher father in a new town. A dog finds his way into the grocery store, causes mayhem, and Opal's life changes. She saves this poor lost dog who in a way saves her. Her new pet, named Winn-Dixie after the grocery store where she found him, gives her the courage to ask her father about her mother who left when Opal was three. In her adventures with Winn-Dixie, Opal makes friends and finds a community around her and most importantly, Opal learns that things aren't always what they seem. Those whose lives appear perfect are real and filled with happiness and pain and those who are mean are most often in need of a friend. 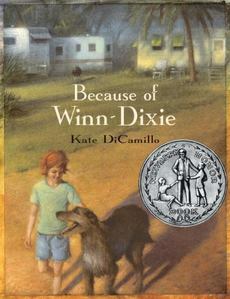 Because of Winn-Dixie is an incredible book that should be read by readers of all ages.